When state and local governments want to spend more than they collect in revenues, they issue bonds. Such bonds are a longstanding feature of the American landscape, going back at least as far as 1812, but during the last decade they have spun out of control, as states and cities have increased their borrowing to indulge in more and more spending on new stadiums, schools, bridges, and museums. They have even started borrowing to cover their basic operational expenses. 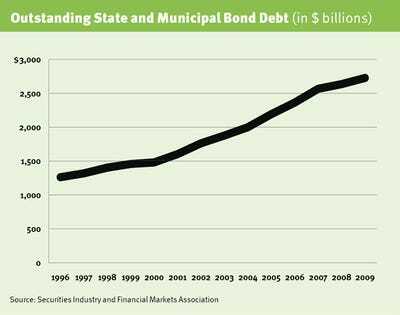 Since 2000 the total outstanding state and municipal bond debt, adjusted for inflation, has soared from $1.5 trillion to $2.8 trillion (see chart). The recession didn’t slow the spending. One reason for the increase in demand for these bonds is that in times of crisis, investors tend to abandon high-risk, high-return assets for safer investments. The presumed reliability of municipal bonds—only U.S. Treasury bonds are considered safer—have made them very attractive. From 1970 to 2006, the default rate for municipal bonds has averaged 0.01 per cent annually. And the average recovery rate for those few municipal bonds that have defaulted is also notably high, about 60 per cent. In comparison, corporate bonds’ recovery rate is about 40 per cent. Municipal bonds are perceived as safe investments because, like U.S. Treasury bonds, they are backed by the full faith, credit, and taxing powers of the issuing governments. Investors know that states and localities can always raid taxpayer wallets to pay off their debts. But in the last two years tax and fee hikes have faced greater public opposition. Last year, for example, Jefferson County, Alabama, was unable to raise sewer fees to meet its sewer bond obligation. Since governments are generally unwilling to cut spending either, the result of resistance to new revenue raising has been substantial increases in states’ and cities’ debt levels. Detroit and Los Angeles have announced that they may have to declare bankruptcy, as have a number of smaller cities. Usually, as a borrower becomes a riskier prospect, lenders start pulling away. At the very least, worried about the prospect of losing their investment to default, they don’t increase the amount they lend. But municipal bonds have not yet lost their low–risk reputation. According to the Investment Company Institute, $84 billion went into long-term municipal bond mutual funds in 2010, up from $69 billion in 2009. And the 2009 level represents a 785 per cent increase from the 2008 level of $7.8 billion. Artificial incentives have lured investors into thinking that lending cash to bankrupted cities will be profitable. It helps that interest on municipal bonds is often exempt from federal taxes. Most are exempt from state and local taxes as well. Because they gain from the exemption, investors, especially in the higher tax brackets, are willing to accept the bonds’ lower yields. More important, investors believe cities and states—especially states, which can’t legally declare bankruptcy to escape debts—will resort to anything to avoid reneging on their obligations. And if they default anyway, investors assume the feds will bail them out. Washington already has bailed out the banks, the automobile industry, homeowners, and local school budgets; it isn’t unreasonable to assume that it will decide the states and cities are also too big to fail. Consider what happened in 2008. Government revenues started to fall, signaling to investors that bonds might be riskier than they thought. At the same time, several insurers that typically backed municipal bonds went bankrupt or exited the market, meaning that buyers were left unprotected against the risk of default. Instead of seeing this downturn as an incentive for states and cities to change their behaviour, Washington stepped in with a new municipal offering. The Build America Bonds program, part of the American Recovery and Reinvestment Act of 2009, was aimed at subsidizing bonds for infrastructure projects. Under this program, the Treasury Department pays 35 per cent of bond interest to the issuing government. If a state or local government issued a bond at a high rate to make it appealing to investors—10 per cent, say—the Treasury would make a 3.5 per cent direct payment to the issuer. In exchange, the federal government gets to tax the returns on the bonds. It’s no surprise that, starting in 2008, states and cities increased their debt dramatically, while investors enabled this overspending. Two years later, things have already taken a bad turn. In May the financial advisory firm Alex Partners LLP reported that 90 per cent of the restructuring experts it polled believed a major U.S. municipality would default on its debt in 2010. By the time this column is published, that prediction will be either fulfilled or falsified. But even in the best-case scenario, a municipal debt crisis looms in the near future. The parallels with the housing bubble are worrisome. Prior to the meltdown, mortgages were perceived as very low-risk investments. Banks were encouraged through government policies to lend large amounts to people, whether they could afford it or not, and borrowers were encouraged to spend more than they should. Both lenders and borrowers had faith that nothing would go wrong—and that if anything did go wrong, Washington would save the day. Like homeowners, states and cities splurged on debt and found inventive ways to get around borrowing limits to finance projects they couldn’t pay for otherwise. And recently the federal government encouraged investors to pour their money into the coffers of these less-than-creditworthy borrowers. The state and municipal debt crisis could culminate in a request for the third near-trillion-dollar bailout of the last two years. That much federal borrowing on top of the current debt could very quickly have an impact on interest rates and on the dollar. And at that point, we can just forget about the recovery. Contributing Editor Veronique de Rugy ([email protected]) is a senior research fellow at the Mercatus centre at George Mason University and reason‘s economics columnist. This post originally appeared at reason.com.